One of the most intriguing technologies to hit the lighting industry recently has been the LensVector liquid crystal lens system, which produces a zoom lens without any mechanical moving parts. This technology is likely to radically affect both the form factor of spotlights and projectors while also giving lighting designers the chance to add more dynamic lighting effects into their projects. The LensVector dynamic liquid crystal lens technology was originally developed by Dr Tigran Galstian and his research team at Laval University in Quebec City, Canada. The system works by aligning liquid crystal molecules to a shaped electric field to establish a digital lens. By changing the electric field, the nature of the lens, and therefore the illumination effect, can be manipulated. LensVector was started in 2006 to commercialise the technology and initial applications that were for use in non-lighting applications. After a decade of development the significant potential in the lighting market has become apparent. Lighting designers are excited by the added level of control provided, and a variety of lighting manufacturers have already shown products incorporating the LensVector modules. Eulum was one of the first companies to start working with LensVector technology and integrated it into their Arcane LED module, complete with LED light engine, heat sink, driver and Casambi Bluetooth control that was introduced at Light+Building this year. Eulum was founded in the UK in 2005 by Marcus Worthington, a lighting industry veteran with previous experience at Marlin, Trilux and Zumtobel. The company started as a lighting design consultancy but then moved into luminaire design, development and production. The US company was formed a few years later in 2008 as a partnership with Brian Gery, an experienced electronics designer who Worthington had met while looking for help developing LED drivers. The company has grown rapidly by developing innovative technical lighting products for lighting manufacturers and end users, including a wide variety of technically challenging exterior amenity and architectural luminaires, AC driven LED downlights and even a solar-powered, wireless-controlled helicopter landing lighting system for use on oil rigs. In recent years, Eulum has partnered with Xicato and Casambi to develop Bluetooth wireless-controlled LED drivers. The involvement with LensVector started in 2016 when Eulum was contracted on an exclusive basis by a US lighting company to develop controls for downlights and spotlights incorporating Casambi and LensVector technology. After that project was completed and successfully launched, Eulum was free to develop its own products incorporating these technologies, which resulted in the Arcane modules. The initial release of Arcane modules includes three versions: white, tuneable white and RGBW. 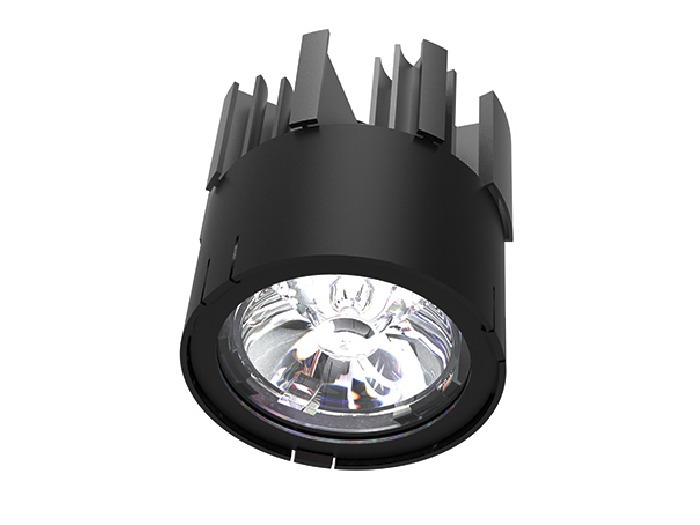 The four LED light engine is integrated with the driver and Casambi module, which is mounted onto an industry standard extruded heat sink. The light output from the light engine is collimated by a Gaggione ten-degree narrow beam colour-mixing lens. The resulting beam is then controlled by the LensVector liquid crystal beam controller. This combination allows the beam to be adjusted from a ten-degree spotlight distribution up to 50-degree flood. Eulum had an on-going relationship with Casambi so working with them to add a fifth channel to the existing four channel RGBW module to control the LensVector focusing was not a major problem. The module runs from a remote 48-volt DC power supply and draws around fifteen watts when on full power. The light output of up to 1,500 lumens for the white and tuneable white versions, when on full power, will be sufficient for smaller retail and museum spaces. It is understood that later versions of the modules will run at higher power with the driver components separated from the LED light engine to allow for improved thermal management. The RGBW version produces a lower light output of around 600 lumens with all four LEDs on full power reflecting the much lower efficiency of the RGB LEDs. Control of the LensVector focus and LED dimming/colour temperature adjustment or colour changing is all achieved via the Casambi App. 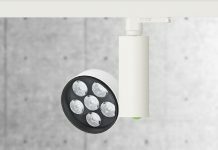 It seems likely at this stage that individual focus control of each luminaire will be required so the marriage of Casambi with LensVector is an excellent one. The lit effect from the module is attractive with a smooth distribution at all beam angles. It is understood that the range of Arcane modules will be expanded in the future to meet customer requirements for higher power and light output. Since Eulum is also a partner with Xicato there may be versions incorporating a Xicato light engine, Casambi wireless control and LensVector focusing. The primary reason for luminaire manufacturers to incorporate the Eulum Arcane modules in their products is that it allows them to rapidly test the market for LensVector-based products without needing to invest in the required electronics design and development. 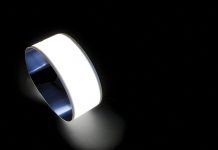 The speed at which the market for LensVector develops will to some extent be dependent on the added cost of the technology, so being able to use an off the shelf module for first generation luminaires is likely to be an attractive option. For lighting schemes where fixed focus downlights and projectors will do the job it may be hard to justify the cost. 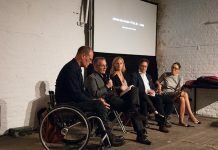 However the initial enthusiasm shown by lighting designers for this technology indicates that they would like to introduce the kind of dynamic effects generally associated with event lighting luminaires into smaller scale retail and museum applications.